As I drove towards Safford I found myself seeing things crisply and clearly through new eyes, really taking in the breathtaking beauty. I have heard this “being in the moment” described as living life in high definition. FP and I had always talked of retiring in Flagstaff, one of my favorite small towns in Arizona, and I found myself thinking I might still do that even without him by my side. I was pleased that I could see myself living out my life’s dreams. I had flown into Phoenix earlier that day and had attended liturgy in my church in Scottsdale. Fr. 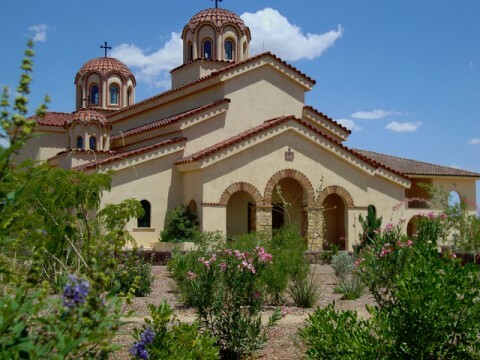 A administered communion and a blessing to travel to St. Paisius Monastery as part of the healing, post-divorce spiritual prescription he had given me. I was on my way to spend time with the nuns in solitude. I stopped along the way to change into my “nun outfit” before arriving. The dress code at the monastery is strict and I’d dug out an old long skirt from the back of my closet,along with a black turtle neck and opaque black scarf for a head covering. When I put on the outfit and looked at the no- makeup woman in the mirror with dark circles under her eyes, I swore I saw my lightly mustached yia yia looking back at me. I readjusted my head covering, putting it on Jackie O style, and decided the outfit would have to do. I did encounter a bit of a problem right away. Apparently my attire was not ideal. The nuns asked me if I had any clothing that was not so tight. I found a big overstuffed sweatshirt in my bag and put it on, making my appearance even frumpier. The nuns made me comfortable in my quarters, a stark room adjacent to a classroom that was used to teach the children who lived at the monastery. They directed me to a listing of service times and told me guests were expected to be at services. I love Orthodox services, and I was anxious to take in as many as possible. After putting my meager belongings into a drawer, I was ready to go to the first service. It’s a breeze to unpack when you are not accommodating plugs for iPads and cell phones, trying to find wi-fi and sorting makeup, blow dryers and assortments of clothes and shoes. Services at St.Paisius were held in the tiny original church which was much like a log cabin. A beautiful new church has since been constructed there. The Orthodox nuns dress in black head to toe, wearing a head covering that has a drape behind it. I could see only their faces from mid forehead to chin and mid cheek on each side. I heard their voices chanting in church, the sound of angels. The service was long, and although I was tired from my traveling I was entranced, savoring every minute. I prayed that my trip would be a chance for God to continue to heal me and to show me things about myself that were lessons I was destined to learn. Most importantly, I had come to pray that God would sever me cosmically from my ex husband. Even though the divorce and the church divorce were final by then, I felt the power of the sacrament still holding us together. I had taken to lying in my bed at night using my fingers to act as scissors making a cutting motion just above my heart, metaphorically willing away the emotional strings that still connected me to him. Each morning before the sun rose, the church bells beckoned and I’d walk in my long skirt, baggy sweatshirt and head covering from my quarters to the intimate candlelit church. During my walk I’d feel the power of the moon shining brightly over Mount Graham, the tallest mountain in Southern Arizona. I’d hear coyotes wailing, feeling secluded with God in a blanket of healing energy. Occasionally I would get to church as some of the sisters approached, their long black robes flowing behind them in the moonlight. Many were young and I wondered how they could know they were meant to be nuns. Yet they seemed so serene, and certain. I have heard them described as “prayer warriors.” Secluded in the monastery their primary role is to pray, like a front line defense for all of us. Throughout my visit I stood for long hours in services surrounded by these sisters, feeling closer and closer to God and letting their sweet chanting and singing pour into my soul, a healing medicine. Between services I stayed in solitude praying and reading Path to Sanity uncovering the spiritual basis for the wounds that counselor Sharon had identified with psychological terms. I saw FP in the pages, and myself, and others diagnosed by the Holy Fathers. I read the prescribed practices for restoring our souls through letting go of spiritual strongholds. It made me realize that we are all wounded by life’s events, but the difference in people really comes down to whether we succumb to the wounds and stay broken or whether we take the path to transcendence, rising from the ashes to a new self. All too soon it was time to leave St. Paisius. As wistful as my time was there, I sensed that God had important work for me to do “in the world,” although I couldn’t see clearly what was next. I drove back to Phoenix still without technology. I wanted total silence to take in all that I had experienced. I wanted to savor the sweetness as long as I could. I was learning to let go and trust myself, and I knew when I got home I would incorporate regular times of solitude into my life. Although I had no idea what was ahead, I trusted that God would show me when I got back to Iowa.